Here’s a quick breakdown that looks at the justification for and the goals of each of the 10 capitals of the Capital Crossroads plan. Justification: Common themes in the data research and public opinion were the diverging demographic and socioeconomic trends in Des Moines and the need to ensure the city itself remains strong to drive the overall welfare of Greater Des Moines and Central Iowa. Every city faces socioeconomic challenges; cities such as Nashville have handled them well to strengthen the urban core, whereas cities such as Detroit have not. Goals: The plan calls on leveraging key Des Moines businesses and entities, such as Broadlawns Medical Center and Drake University, as catalysts to invest in and improve their neighborhoods. Part of the idea of neighborhood improvement is geared toward creating a land bank authority to obtain land and properties for the purpose of neighborhood revitalization, and providing incentives for homeowners to upgrade their properties. The plan also focuses on possibly updating the downtown district by refurbishing key infrastructure such as the skywalk and Walnut Transit Mall, upgrading or converting empty office buildings and continuing to develop residential space. Improving awareness of “urban” issues, such as rising poverty rates in the city, is also important. Justification: Economic development must be focused on the region’s most competitive and highest-value target sectors. A previous study leading up to the final plan, the Target Cluster and Marketing Analysis, identified six key industry sectors for the region to target: finance and insurance, information solutions, health and wellness, agribusiness, advanced manufacturing and logistics. Goals: In identifying the target clusters, it’s also important to identify leaders to serve on what the plan calls Target Business Councils to lead discussion on how to best optimize area strategies in the targets. Efforts to improve the business climate could include pushing to ease commercial property tax burdens and leveling the tax-credit playing field for small and medium-sized companies that don’t qualify for state support. A large part of the capital focuses on creating a better environment for start-ups and small businesses, which includes making a one-stop resource for start-ups, developing a “conveyor belt,” which could be the Business Innovation Zone or another similar organization, to help start-ups through the process and leveraging more ways for start-ups to obtain capital. The capital also focuses on better marketing the area for potential businesses to relocate or expand. Justification: “The potential to leverage the stretch of U.S. Interstate 35 between the Des Moines and Ames metropolitan areas for well-planned, sustainable and high-value growth and development could be transformational for Central Iowa’s economy and population base,” the plan says. That includes enhancing the relationships between public and private leaders in Ames and Des Moines. Goals: A group of economic developers from Ames and Story County, Greater Des Moines and other communities along the I-35 corridor, called the Ames-Des Moines Corridor Marketing Group, has been meeting regularly for the past three years. The plan calls for formalizing its role as the official corridor development council. Cynicism was expressed during the planning process that Ames and Des Moines could be viewed in the same way as Cedar Rapids and Iowa City, but the plan calls for recognition that the corridor is viewed that way by prospective employment prospects. An effort to brand the corridor as a key area for biosciences, both to outside regions and for internal recognition, can help with that. To anticipate future growth along the corridor, a conceptual land use plan is called for to prioritize investments and infrastructure. Justification: There is a groundswell of interest in making the region a national model of wellness, which would help the other capitals succeed and attract talent to the health and wellness target sector. Capital Crossroads Tri-Chair J. Barry Griswell said that Gov. Terry Branstad’s recent “Healthiest State” initiative fit in well with what this capital is trying to achieve. Goals: Identifying existing wellness programming and key partners is a first step. In this case, preliminary research findings about what already exists and what is needed would go a long way toward developing the parameters of a wellness initiative. Components could include leveraging universities to the impact of plant and environmental science on health and wellness, more business programs to drive wellness programs, developing more bicycle and pedestrian trails and working with retailers to promote healthy foods. Once a plan of action is identified, marketing the region’s wellness initiative nationally could help draw employees and businesses to the region. Justification: The plan asserts that companies are now following skilled workers, as opposed to the other way around, which represents a large shift in how jobs are created. Developing a trained work force is about creating a pipeline to attract and retain top talent as well as ensure that children and adults are not restricted by factors such as poverty or fear of crime. Goals: The Cradle to Career subsection, which focuses on education, is one of the most extensive in the plan, with nine subsections of its own. Among the first goals is ensuring that pre-kindergarten programming is provided for all Central Iowa children. Others include enhancing partnerships among educators and business people and providing more alternative models of education, such as charter schools. The plan also lays out a vision for a “Stay in Central Iowa” program to try to retain graduates from local colleges and universities. An urban core initiative could be designed based on the model of the Harlem Children’s Zone program, which is intended to provide outreach to help break the cycle of generational poverty. Justification: For the area’s leadership to be most effective, it must reflect the demographic composition of the community and welcome diverse perspectives and opinions, the plan says. Greater Des Moines has succeeded throughout its history because of the vision and philanthropy of its leadership, but the region is changing demographically and generationally. Justification: For the region to be world class, it must make a commitment to the arts as a driver of economic and quality of life development. Arts and culture is a component that cuts across a number of capitals. The capital will incorporate Bravo Greater Des Moines’ soon-to-be released Community Cultural Plan. Goals: Making sure Bravo has the funding to be successful will be a critical part of the capital. Also important is developing a more centralized and coordinated marketing campaign and more collaboration between arts and cultural entities. Though Des Moines was said by stakeholders to have more capacity in arts, culture and music resources than its size would indicate, to position itself more competitively with larger regions, the sector would benefit from more physical space for performances and educational sessions, which is a strategic goal of both the Civic Center of Greater Des Moines and the Des Moines Arts Center. Another strategy to help with capacity could be to develop a mid-sized, 1,500-seat performance venue to book shows that are too big for a small club or theater and too small for a large venue such as the Iowa Events Center. Using the arts to bring strategically attract residents and visitors can benefit the area, and provide an avenue outside of public meetings to bring constituencies together. Justification: Central Iowa must consider the best way to accommodate additional population and economic growth without sacrificing the quality of life in the region. Sustainable growth and development must drive how the region plans for the future and develops the necessary infrastructure. 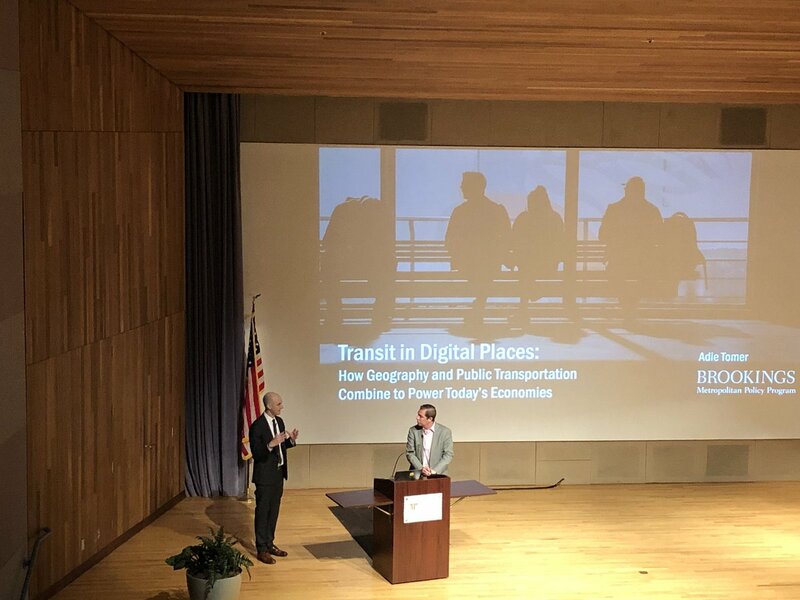 Goals: Combining the Des Moines Area and Ames Metropolitan Planning Organizations should be considered, and if not, the two should still collaborate on planning transportation needs for the future. Finding ways to support the Des Moines Area Regional Transit Authority’s 2035 plan could include identifying potential revenue streams for the service. Figuring out how to revamp Des Moines’ water and sewer systems and developing long-term flood-control efforts are also on the docket. The plan also lists a series of long-term major projects, including commissioning a logistics development plan for the region, initiating a comprehensive study on passenger air service and its potential for competitive enhancement and pushing for passenger rail to come through Des Moines. Justification: Governments are seemingly forced every year to propose and enact painful operating and programming cuts. To more effectively serve constituents, governments should consider high-value, consensus-based strategies. Goals: One theme is to make things more efficient, which could include expanding the Metro Advisory Council to more Crossroads counties, promoting regional zoning and development policies and creating a Metro Water Authority similar to the model of the Metro Waste Authority. Resources can be maximized by developing a shared services task force to identify potential ways to consolidate some regional services and by identifying opportunities to develop revenue-sharing projects between Greater Des Moines and other Central Iowa governments. Finding ways to work together to lobby to the state and federal governments for project funding could provide strength in numbers. Justification: Opportunities exist to leverage environmental assets to make the region more livable and create goodpaying jobs. Goals: The plan focuses on making Central Iowa the “trails capital of the world” and further integrating environmental infrastructure into all aspects of Greater Des Moines life. A number of good things are already happening; leveraging those could help Greater Des Moines become part of the Climate Prosperity Project, which is an initiative that seeks to advance community efforts to address the challenges of climate change from the perspective of economic development opportunities. The area could also consider using its river systems and stream- and creek-side corridors as a “natural utility” to generate revenue. Note: A separate initiative to be worked into the 10 Capitals, known as the Urban Core Initiative, will focus on development of 10 neighborhoods west and north of Interstate 235. The effort is intended to improve housing, security, education, and mental and physical health in order to help residents meet the requirements of the downtown jobs in close proximity to their neighborhoods and bridge opportunity gaps that exist in the areas. Tom Urban, Teree Caldwell-Johnson and Liz Buck will chair the Urban Core committee.